Fill out this form and one of our experts will call you back! The heart of your digital strategy lies first and foremost in your website, including its design and its user-friendliness. No matter what your business is, having an efficient and attractive web platform is essential. Your website may be a user’s first interaction with your company and will be the first thing he will see and think about you. First impressions matter! Eminence, website development company in Dubai, will develop and design for you a web platform that will attract and convince clients and prospects. Don’t delay, just contact our web development company in Dubai to set up a website suited to your needs. Our website development company in Dubai understands the crucial importance of a website and how it can impact a business. As consumers’ behaviour evolves with the latest technology trends, our web development experts will design and implement a web platform specially suited to your needs and the expectations of your target audience. Our dedicated team is composed of talented developers, creative web designers, referencing experts, and experienced strategists among others. Our agency of web development in Dubai will work assiduously to guarantee our collaboration results in a performing website suitable to your needs and enabling your business to take off. Beyond the website creation, we also provide our clients with constant expertise on website optimisation and functionalities. 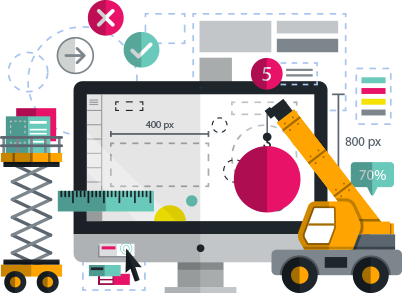 Our website development company in Dubai is always at the forefront in terms of design and users’ behaviour latest evolutions. By doing so, we are always able to optimise the architecture and usability of your website to enhance actual tendencies and attract your target audience. Site maintenance: we offer a maintenance service of your site, integrating the latest information, plug-ins and security updates, back-ups and data archiving. Before our website development company in Dubai can create anything, you must start with a strategic reflection. Think about what your vision and your goals are. For example, are you looking for visibility? Or would you like to generate traffic and obtain conversions? You are the only one who can answer these types of questions, but we can guide you through the process. Once your goal and objectives are defined, our web development company in Dubai will be able to create for you an effective website able to meet your goals. There are different aspects to consider in the development of your website. The design of the site is a very important feature since it will reflect your graphic identity and positioning. A good design will have a major impact on the first impression your clients form. A powerful design will enable your users to easily recognize your brand’s style. In the next stage, our web development agency in Dubai will work on the overall user experience: visual, ease of navigation and content quality. Our web development company in Dubai will establish a website structure that allows setting up a solid and effective strategy of organic referencing to optimise your visibility on the web. As a digital marketing agency in Dubai, Eminence is a key partner in facilitating your website design. We guarantee the success of your company by allowing your website to have an excellent visibility on search engines. At Eminence, agency of web development in Dubai, our motto is to satisfy you completely through a powerful website that allows you to gain new customers. Are you interested in WEBSITE CREATION? Do you have digital objectives to achieve? We love challenges! Request a quotation, meeting or advice on your business to agency@eminence.ae or complete the form below.